One reason many people are reluctant to start a home business is fear of complicated taxes. While self-employment taxes are a little more involved, they're not necessarily hard. Further, having a home business offers some appealing tax advantages. 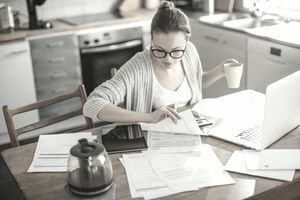 Home business deductions are a wonderful way to recoup some of the costs from business expenses, and they can also offset the cost of any taxes owed. But, before going hog-wild with deductions, it is important to understand which deductions are valid and which deductions you should be careful about or that may raise an audit flag. 1. Can I deduct the portion of my home I use for my business? There was a time when home business owners who qualified for this deduction wouldn't take it because some thought it would raise a red flag for IRS auditors. Fortunately, that's not necessarily the case. Even better, the IRS changed how to deduct home office use, making it easier and than ever. Even so, there are a few requirements that need to be met to take the home office deduction. The most important of which is that your office space is used exclusively and regularly for business. This means an office which serves as your place of business and the family computer room at night will not qualify for a deduction according to the IRS rules. With that said, you don't need to have an entire room to yourself. You can portion off a section of a room that is used only for your business. You can only deduct the portion of your home that is used for business. So if your home office takes up half the living room, you can only deduct half the living room. Further, this office must be the primary place that you do business. There are a couple of exceptions to the home office rule related to day cares and inventory stocking, but for the most part, your home office must be where you do business, and business is all that is done in that space. The IRS allows two options for the home office deduction. The regular method allows you to multiply the percentage of office space in your home with home operating expenses such as rent, mortgage, and utilities. So, if your home office takes up 5 percent of the space in your home, you'd multiply that by your home operation costs. The increase in the number of home offices recently led the IRS to create a second, more simplified, option for the home office deduction in which you multiply your home office square footage (maximum of 300 square feet) by $5. So if you're home office is 100 square feet, you multiply that by $5 to get $500. 2. Now that I’m self-employed, can I write-off my car as a business expense? The good news is that you don't have to have a separate business car to deduct the business-related cost of your vehicle. The IRS allows you to deduct actual costs of having your car for business, but the easier option is to track your business driving miles and multiply it by that year's per-mile cost. As with all self-employed tax deductions, the key is to keep detailed records and differentiate between business and personal use of the car. You can use a handwritten logbook or use an app on your smart phone, although you'll want to check that it's measuring miles accurately. 3. What type of expenses can I write off? There are many different expenses a business can deduct. Probably more than you think. Home business deductions come in two categories: direct expenses and indirect expenses. Direct expenses are those directly related to creating your product or providing services. For example, if you're a blogger, your web-hosting and domain name purchase/renewal would be a direct expense. Indirect costs are those that can't be linked to the outcome of a specific product, but are needed to sustain the business. Examples of an indirect cost would be Internet access, which not only allows you to blog, but also to market, email, provide customer support, etc. You can get an idea of the types of things of you can deduct by reviewing this list of possible deductions. While writing off expenses sounds easy and straightforward, you need to be careful that you don't take a full deduction when only part of the expense was used in business. For example, if you purchase a new computer for your business, but also use it for personal use like storing photos, music, and games, you will need to keep track of your business use and deduct only that percentage. Another area to watch for business vs personal use is your cell phone. If you use your cell phone for both business and personal, you will need to track what percentage of your time is used on business calls vs. personal calls. The Internet, is another tricky deduction if it's used both for business and pleasure. 4. Can I write off my health insurance payments if I have an individual insurance policy? If you are self-employed and pay for your own health insurance, you can deduct the full cost of your health insurance premiums as a personal deduction. It is important to note that in order to deduct your health insurance expenses, you must have a net profit from your business. If you break even in your business or experience a loss, you'll have to take the medical expense deduction on your individual return using Schedule A. 5. Do I need receipts for all my deductible expenses or can I use credit card statements as proof? Keeping and organizing receipts is crucial in case you have to prove your expenses in an audit. The burden of proof on any business expense deduction is the "Four Ws": Who, What, Where and Why. If you can prove the need for the expense with various other means, such as a car log and credit card statement, the IRS may accept it. The safest way to prove an expense is with a receipt and a note detailing who, what, where, and why. Disclaimer: I am not a tax specialist or licensed tax attorney. The information provided here should be used as a general guide. For specific questions about your own taxes, please consult a tax specialist or refer to the official IRS publications.